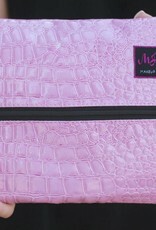 The Blush Bag is a light pink gator texture exterior and has a black wipeable interior. The MJ designers ensure that each handcrafted Blush bag comes with a onyx zipper and a coordinating tassel. Care Instructions: The Blush bag is spot clean treatment only, do not use iron.